Congratulations to Brynn Freeman on winning our twenty seventh High Five Giveaway and thank you to all who entered! 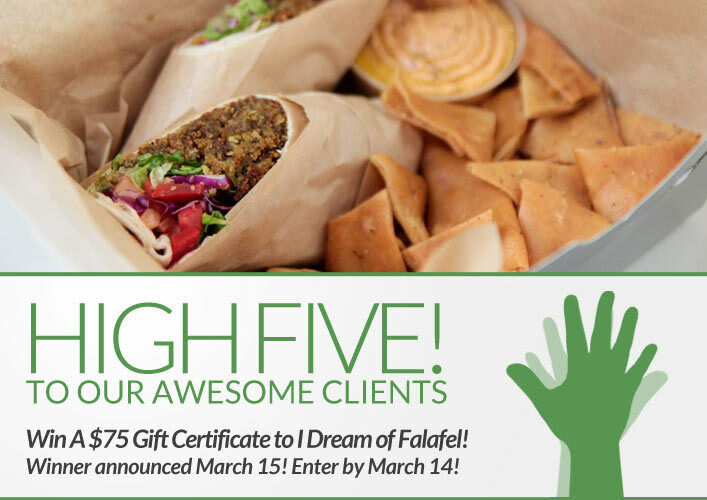 Our next High Five Giveaway is for a $75 gift certificate to I Dream of Falafal. I Dream of Falafal has 4 locations in the Chicago area with one at 112 W. Monroe and one at 555 W. Monroe. Visit their website at www.idreamoffalafel.com or call them at 312.263.IDOF for more information. What decades have men’s hairstyles been influenced by the past couple of seasons? Now, just add a comment to this post with the right answer to be eligible to win! The winner will be announced on Friday, March 15. Entries must be received by midnight on Thursday, March 14. Good luck! 1920s and 1930s. I LOVE I Dream of Falafel. By the way, you misspelled it. It is Falafel not Falfal. Men’s hairstyles have been influenced by the twenties and thirties. The 20’s and 30’s. And i love it.